In parts one and two of this ongoing primer on leak testing, we discussed pressure-decay testing and differential pressure-decay testing, respectively. Although those leak-testing methods remain the most widely used, it is often because they are assumed to be the least expensive leak-testing method. To recap: Pressure-decay transducers for leak testing are the least expensive leak-testing sensor technology, often making pressure-decay methods the least expensive route for a given accuracy. However, pressure-decay methods are the slowest methods for leak detection. 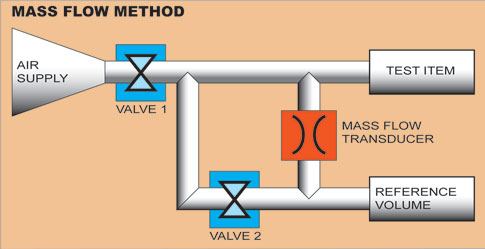 In the mass-flow method (see figure 1), a part is pressurized along with a reference volume, and the amount of air that flows into the part to replace a leakage flow is measured directly in standard cubic centimeters per minute (sccm). A number of error proofing techniques are also available to guarantee test system reliability.The alternative to pressure-decay test methods are leak-testing systems using mass-flow sensors, which can provide fast and accurate testing over a much wider range of leak/volume ratios and testing conditions at about the same cost as differential pressure systems. Figure 1: The key difference between this and the differential pressure method is that the mass-flow transducer reads the flow of air moving from the reference volume into the leak test item. The result is a direct reading of the leakage rate. Mass-flow sensors are most often temperature-sensitive resistors that measure the temperature of incoming and outgoing flow as leakage flow is directed across a heated element, thereby transferring some heat to the flowing gas. If there is no leak, resistors are exposed to the same temperature. If there is an imbalance between resistors’ temperatures, a voltage is generated that is proportional to the mass flow. In this way there is a one-step direct measurement of the leakage rate. InterTech’s mass-flow sensors have the capability to accurately detect and measure leaks as low as 0.01 sccm. This permits their use in applications that were previously believed to be beyond the capability of production leak detectors. To this day, many mistakenly use much more expensive helium leak-testing methods because they do not appreciate that state-of-the-art mass-flow leak detectors can achieve required accuracies. Indeed, there are many antiquated mass-flow leak detectors that one can still find in the marketplace, identifiable by their use of mass-flow sensor technology that is slow, costly, and in many cases not suited for use in production leak testing. This has especially been true in applications involving low flows when leak detectors using transducers developed for the semiconductor industry are selected. Modern mass-flow leak testing technology uses sensor designs that are not susceptible to clogging and are ideally suited for a wide range of industrial leak-testing applications. For example, InterTech Development Co.’s multi-channel touch screen mass-flow leak detectors achieve 0.01 sccm accuracy in leak measurements using patented mass-flow transducers that provide direct measurement of leakage with NIST traceable calibration. Calibration and compensation for temperature and creepage effects are readily accomplished in systems using mass-flow detection, further extending their range of applications. • Is the mass-flow sensor designed for rapid cycle accurate leak testing? • Is gauge repeatability and reproducibility (R&R) of the entire leak-test system in the industrial environment stipulated—not simply the gauge R&R of the leak detectors, which is only one component of overall performance? • What temperature variations will the system handle? • Does the mass-flow leak detector enhance performance with features such as: auto zero; test part temperature compensation; rapid and easy interchange of test sequences, providing ability to customize and recustomize leak testing for various products without any production delays; real-time display of all test stages and results, and data storage in buffer of test records; and tight integration of control software with mass-flow transducers and other system components? In summary, mass-flow sensors need to be specifically tailored to the leak testing requirements of a given application. Testing also requires automatic temperature compensation to ensure accuracy. When these requirements are met, mass-flow testing can detect leaks as small as 0.01 sccm. The larger the part volume, the better mass-flow test methods are when compared to pressure-decay leak testing methods. However, there remain many critical leak-testing applications where mass-flow leak testing methods do not deliver the required sensitivity. In Part 4 of this series, we will discuss helium mass spectrometer leak testing that is required for many stringent leak-testing applications.